Dream, Believe, Dare, Achieve . . . SHOOTING Stars - Students 4 to 12 years old. MEGA Stars - Students 12 to 17 years old. SUPERNOVAS - Adult Students only - 18 years and older. Take a look around our website, we hope you enjoy your visit. If you would like to join our academy, please complete an application form. Remember your first session is free, so why not come and have some fun . . .
JGDATA Ambassadors . . . The John Giller Drama and Theatre Academy run a special program called the JGDATA Ambassadors programme. This is a special role for students to aspire to within each of our academies and holds important responsibilities. Each Ambassador, not only represents us as being a provision of excellence but also they take charge of parts of the session. For example they lead the warm up, ensure students are safe and happy, create and start the initial set-up games and much more. Empowering students to take ownership of their creativity builds trust and inspires others to achieve, develop and grow. 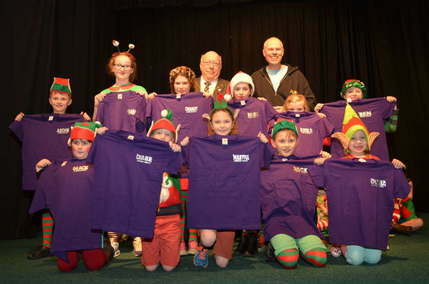 Our JGDATA Ambassadors are awarded their T-shirts by John and Cllr David Whitby , the Deputy Mayor of King's Lynn and West Norfolk after a performance event. We are proud to be the only Drama and Theatre Academy in West Norfolk offering outstanding educational provision for the Norfolk Children's University. It's our badge of excellence, and we are proud to have earned it.